Managing your leads is key to your business’s success. Responding to leads effectively can help you to grow your revenue – however, with no structure in place, you might find these leads are dropping off in the sales process. As well, tracking your leads can help you to generate higher-quality leads – those that are spending more money, more often on your products or services, or are guaranteed to convert. Before you can begin managing your leads, you’ll need to have a clear idea of who your leads are based on their behaviour or demographic, for example. It’s also important to separate prospects from leads. Determine how your prospect became a lead: Were they referred from an ad campaign? Did they come to your website directly? Tracking and measuring these metrics will help you to determine how to generate more leads and how to assign them appropriately. Respond to leads quickly – typically between 24-48 hours. Ensure you’ve assigned each lead to the appropriate salesperson or representative, and identify where opportunities are that differentiate your leads. For example, is this a sales qualified lead or a sales accepted lead? As well, high quality customer service and support is crucial at this stage, and all sales reps should be aware which stage of the sales funnel a particular lead is in in order to offer appropriate support and services to secure their business. This is the part of the sales process where you’ll need to get more personal, whether through email campaigns, targeted promotions and content, effective call-to-actions and so on. Using digital tracking and measuring will help you to see how a lead interacts with your products, services or brand before converting. Tracking and reporting ensures that once a lead is assigned or converted, you are analysing your efforts to see gaps or areas that need improvement – whether through your marketing efforts or your in-house customer relationship management. Pinpointing areas in your sales funnel where leads are dropping off can help you to reach your goals. 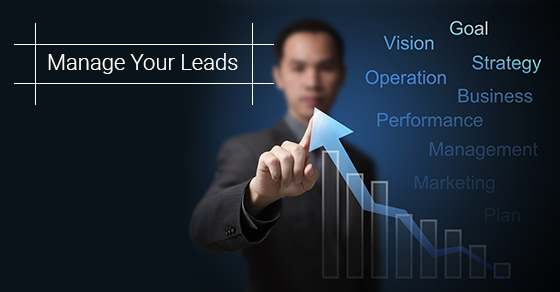 It’s through lead management that you see the combined results of your marketing efforts and sales initiatives. Keeping the above tips in mind will ensure nothing slips through the cracks in your lead management strategy.